Most people don’t understand autism. It’s hardly their fault. Doctors struggled with it for much of the last century. The word didn’t exist before 1908. It wasn’t until 1980 that the American Psychiatric Association added it to the Diagnostic and Statistical Manual of Mental Disorders. Researchers largely missed the overarching connection to similar conditions like Asperger’s Syndrome and Rett Syndrome until 2013. When Texas Tech University turned its attention to autism in 2005, it was a modern day pioneer in the region. But with the support of namesakes and longtime benefactors Jim and Jere Lynn Burkhart, the university chartered a new center. Its three-fold mission: to improve the lives of people living with autism by providing services, training professionals and conducting research into the causes and most effective treatments for the developmental disorder. The Burkhart Center for Autism Education & Research has been at the forefront of helping people understand autism ever since. From inception, the Burkhart Center’s goal of improving the lives of people with autism and their families has remained constant. Relatively young compared to its peers, the center’s work has received no shortage of recognition over its short history. The latest arrived in February, when the center was honored as a 2019 Thought Leader in Special Education by the Council for Exceptional Children, one of the world’s largest special education organization. It’s an elite honor — the Burkhart Center was one of eight organizations selected from across the U.S. Such accolades validate the Burkhart Center’s approach and provide greater visibility for the program, attracting new researchers and students to the center and expanding its service area to families and communities beyond the state. Even with the national spotlight, the clinic doesn’t shrink from its role of caring for West Texas. In many ways, it’s more committed than ever. Last month the center launched a new mobile autism clinic to extend its reach into rural parts of the state. The Mobile Outreach Clinic for Autism — a kind of “Burkhart Center on wheels” — will travel to underserved communities to provide training and support for families and caregivers, resulting in better care and treatment for children with autism. The mobile clinic is staffed with a licensed mental health provider who can provide diagnostics and services including autism screenings and counseling. Families who require additional services can be connected via the clinic’s computers and video technology to board certified analysts and clinical staff at the Burkhart Center’s offices in Lubbock. Texas Tech’s efforts are part of a larger grant funded by the Texas Higher Education Coordinating Board. In total, seven Texas universities will expand their services to more than 2,200 children diagnosed with autism across the state. 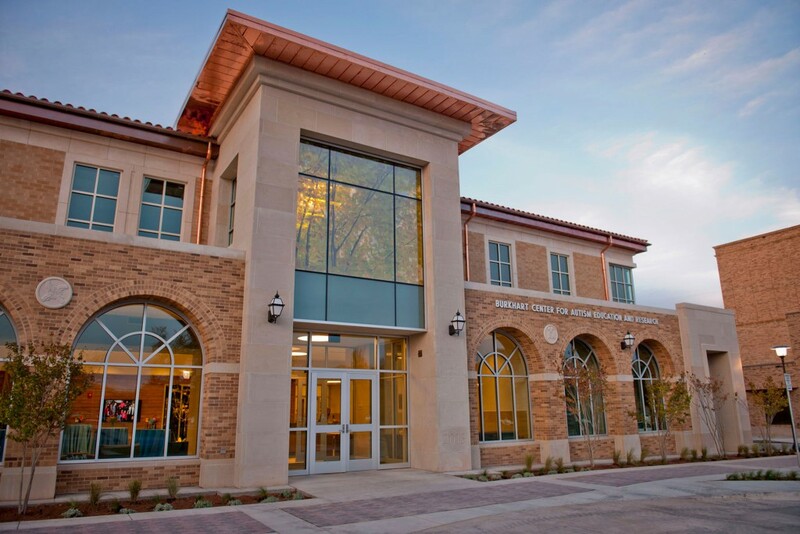 The Burkhart Center has seen its footprint at Texas Tech grow over the last few years. A new building funded by philanthropy opened in 2013, expanding the center’s capacity. Today, the group offers 15 clinical services and seven research labs currently working on multiple funded projects across the lifespan of people with autism. Make a gift online to support the Burkhart Center's life-changing services, training and research. The center also serves as a catalyst within higher education, hosting its Higher Education Think Tank to share successful strategies, challenges and research with other U.S. universities. The third annual event kicks off today, April 2, as part of the center’s emphasis on World Autism Awareness Month. For the center, its expanding impact and leadership position in the autism community underscore more than a decade of hard work and dedication to its core mission. Whether through serving people with autism and their families, training professionals or advancing the state of research, the center continues to change lives at Texas Tech.